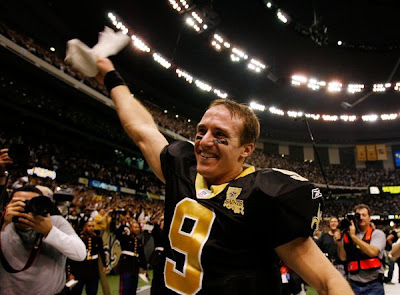 On her show that day was Drew Brees, quarterback for the New Orleans Saints and MVP of the 2010 Superbowl! I've never really known much about him until his team won the Superbowl, but now I can tell you I'm definitely a fan. I was so impressed by his interview with Ellen (you can view the interview HERE). He told Ellen that he doesn't pay attention to the scoreboard when he plays. He just focuses on making each play the best he can possibly make it. He said, "when you get yourself into a scoreboard watching contest, you get your mind off of the game. It doesn't matter what the score is until the final bell hits." I've been thinking all week about how applicable those statements are to life. Scoreboard watching seems to be a natural tendency we all succumb to at one time or another. I think we can all remember at least a time or two when we've gotten caught up in how we (or our family) compare to others or about who's ahead in the game. We can so easily get caught up in who has more money, the nicer home, the better wardrobe, greater success, more creativity, better looks, the better body, is better educated, has greater talent, is more spiritually gifted, etc. etc. etc. I catch myself doing it a lot as mother. I compare Bryson's physical and mental development with the kids he socializes with, always secretly hoping he's "ahead" or "better." When we compare, our minds are taken off the game and we lose eternal focus. Our focus is to win the game, not by watching the scoreboard, but by becoming the very best of ourselves with every breath we take--or in other words, to become as Christlike as possible. That is how we win. It's not about keeping up with others. It's about keeping up with ourselves. Being the best WE can be with each breath we are granted is where our focus should stay. If our focus is constantly on others and how we measure up (or don't measure up) to them, we will quickly lose sight of our eternal potential, and in the end, we will not become much of anything. So today, I'm putting on blinders. Blinders so I can start focusing on what's in front of ME instead of what's in front of everyone else. Making the best of the life and abilities I have been given. Because in the end, all that matters is who I am and who I've become when the final bell hits. P.S. On a very random and un-related side note, have you seen THIS Old Spice commercial?? I about pee'd my pants from laughter when I first saw it (it's better when you see it on TV). I think it's my favorite commercial of all time. I'm glad my man smells like a man!